Quality of life (QOL) in African Americans with gout is significantly worse compared with their Caucasian counterparts, according to data from a two-center prospective cohort study. The results showed worse mental and health-related (HRQOL) and more functional limitations in the African Americans, found Jasvinder A. Singh, MD, from the University of Alabama at Birmingham, and colleagues, reporting online in Rheumatology. The differences between the races on the mental/emotional HRQOL were clinically meaningful in most cases, but whether the differences in HRQOL "are true differences by race or whether they can be explained by unmeasured differences in socioeconomic status, social support, and health care access across race remains to be determined," the researchers wrote. "Nevertheless, our study shows that in multivariable-adjusted analyses, African Americans with gout had larger mental/emotional HRQOL deficits compared with Caucasians." Via the use of electronic medical records, 186 adults with a diagnosis of gout at the VA Greater Los Angeles Healthcare System and the Birmingham VA Medical Center were identified and enrolled in the study. Patients were recruited through phone calls and primary care, rheumatology, and other specialty clinics at the two sites. The University of California at San Diego healthcare utilization survey. Patients also underwent physician assessment at each visit, including a global assessment of gout. Almost all (97.9%) of the study cohort were male, and the mean age of the overall cohort was 64.6. The median serum urate level was 7.9 mg/dL, and almost one fifth of patients had tophi. Median physician and patient gout severity assessments were 3.0 and 6.0, respectively, on a scale of 0 to 10. Comorbidities were common: 81.4% of patients had hypertension, 36.2% had diabetes, 15.4% had congestive heart failure, 24.4% had moderate or severe renal failure, and 58.9% had hyperlipidemia. Compared with Caucasians, African Americans with gout were significantly younger (61.1 versus 67.3 years), had lower education level, higher median serum urate levels (9.0 versus 7.9 mg/dL), and a lower prevalence of tophi. In unadjusted analyses, African Americans with gout had significantly lower mean scores (indicating poorer health) on the mental health (39.7 versus 45.2), role emotional (42.1 versus 51.4), and social functioning (36.0 versus 40.0) domains of the SF-36 and on the mental component summary score (43.2 versus 50.0) relative to Caucasians (all P≤0.02), but the differences between races on the SF-36 mental health and social functioning were no longer significant on adjusted cross-sectional analyses. The adjusted SF-36 role emotional score was lower in African Americans (P=0.01), and the difference was clinically meaningful, as it exceeded the minimal clinically important difference of 2.5 (difference of 7.5). The mental component summary score was also lower in African Americans, with a minimal clinically important difference of 4.4, although not quite significant (P=0.07), the researchers reported. Longitudinal adjusted analyses showed that five of the eight SF-36 domain scores (physical functioning, bodily pain, mental health, role emotional, and social functioning) and mental component summary were significantly lower in African Americans compared with Caucasians, and that the differences were clinically meaningful. Regarding gout-specific HRQOL by race, African Americans with gout had significantly worse HRQOL in four of the five GIS domains, including gout concern overall (P=0.04), unmet treatment need (P=0.01), well-being during attacks (P=0.01), and concern during attacks (P=0.01), with differences exceeding the minimal clinically important difference for all four scales. On multivariable adjustment, the difference in only one of the five GIS scales -- unmet treatment need -- was significantly worse in African Americans compared with Caucasians (P=0.03) and was clinically meaningful. In adjusted longitudinal analyses, two GIS domains (unmet treatment need and concern during attacks) and overall GIS scale scores were worse in African Americans compared with Caucasians. Although these differences were significant, they did not exceed the threshold for a minimal clinically important difference. The composite HAQ-DI score was not significantly different between African Americans and Caucasians (P=0.12). Singh et al noted that a major limitation of the study was the overwhelming proportion of males in the study, and although males constitute the majority of the gout population, "there is a growing female subset with elderly-onset gout." 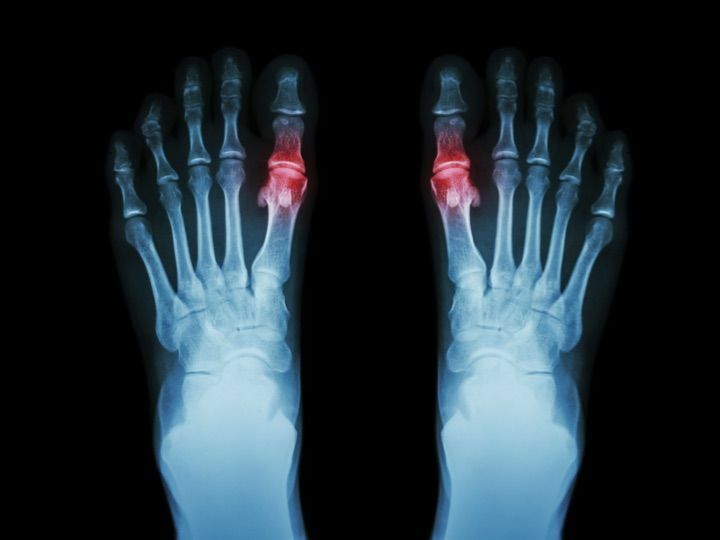 In addition, patients with mild gout may have been missed, recall bias was a possibility given that the results were based on patients' responses, and about one fourth of patients were excluded from longitudinal analyses due to missing data.